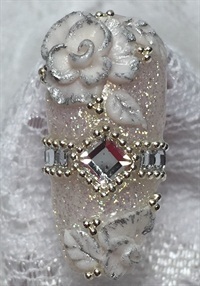 Jen Fetty of Middleton, Idaho, shows how to make this blingy bridal design. 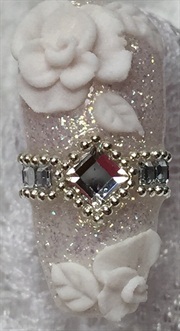 Jen Fetty (@jenfetty) of Middleton, Idaho, shows how to make this blingy bridal design. 1. Clean and prep the nail. Apply glitter acrylic to the entire nail using a form to extend the free edge forming the ballerina/coffin shape. 2. 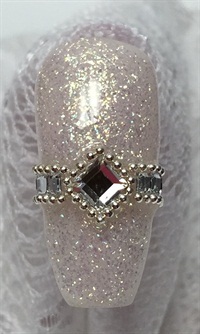 Apply a thin layer of clear builder gel over the entire nail. Apply embellishments. Cure in UV/Led light. 3. Sculpt 2-D roses and leaves. 4.Tip the roses and leaves with metallic acrylic paint. Cover only the acrylic paint with gel top coat, taking care not to cover the whole flower. Apply a thin layer of gel top coat to the areas where you want to place the metal beads. Lay metal beads into the uncured topcoat. Cure in UV/LED light.